That turned out to be extremely dangerous work. In May 1941 the Deutsche Gasrusswerke started the construction of the factory in Gliwice (Gleiwitz) at a distance of about 60 km from Auschwitz. Degussa had the ultimate responsibility for the planning and construction of the buildings and for controlling the installation of the production components. The carbon black that was produced was needed for the production of car tires. Because of the war there was great demand for this material, and this caused the fast installation of the factory to be a very high priority. Prisoners could be appointed as commanders of the labor units. They were the so-called kapos. The foremen helped the kapos, who were the supervisors assigning work but who didn’t work themselves. The camp elders, the block elders, the kapos, and the foremen were required by the camp commanders to wear a black band with white lettering around their left arm. 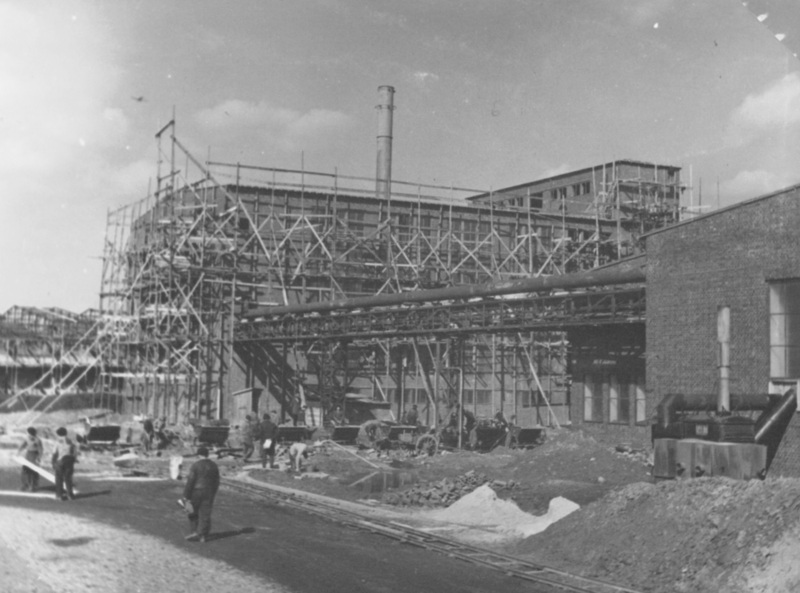 Construction of the boiler house in Gleiwitz © Evonik Industries AG, Corporate Archives.